DowntownDC BID now benefits from an integrated end-to-end solution for spatial data management. ArcGIS for Server serves maps and applications. GIS streamlines the data collection process, aids quality control, and integrates 311. The downtown business district in Washington, DC, is a bustling hub of tourism, business, and residential activity comprising more than 500 commercial buildings and a host of DC landmarks, including museums and cultural institutions, as well as the Gallery Place, Chinatown, Federal Triangle, Franklin Square, McPherson Square, Midtown, and Penn Quarter neighborhoods. Formed by local businesses and funded by property owner tax assessments, the DowntownDC Business Improvement District (DowntownDC BID), which includes the area from Constitution Avenue to Massachusetts Avenue and 16th Street to North Capital Street in northwest DC, is dedicated to the improvement, marketing, beautification, and maintenance of this special district. The primary goal of the organization is to tend to the well-being of the area’s public environment, local economy, and community safety to help promote and retain businesses. 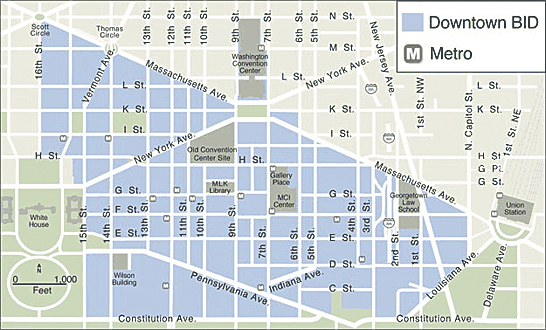 The DowntownDC BID Boundary Map, a 138-block area of approximately 520 properties from Massachusetts Avenue on the north to Constitution Avenue on the south and from Louisiana Avenue on the east to 16th Street on the west in Washington, DC. 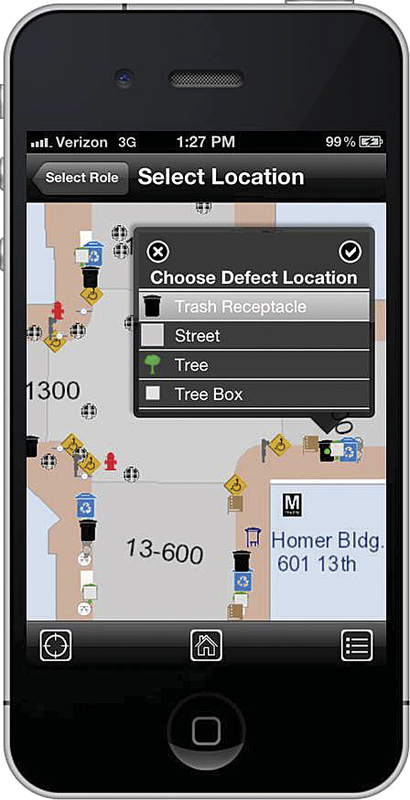 To maintain a safe, healthy urban atmosphere, DowntownDC BID continuously monitors and evaluates the condition of the district’s facilities and environment with the help of its more than 80 safety, hospitality, and maintenance workers (SAMs). SAMs are responsible for field data collection relative to fixed assets and variable conditions throughout the district, including features such as trash receptacles, benches, fire hydrants, bus shelters, and parks/open space areas. At the heart of their mission, SAMs track and report the acceptability of these assets as it relates to their condition, but with more than 80 different SAMs keeping detailed, paper-based records of the DowntownDC BID area, challenges naturally arose with respect to maintaining the accuracy, integrity, and timeliness of the data collected. It was clear that to successfully track and maintain the inventory, DowntownDC BID was in need of an asset management solution that would allow the SAMs to efficiently and accurately gather information in the field and provide in-office editors with the ability to verify this data and then rapidly push service requests to the district government’s work order management system. To address this challenge, DowntownDC BID teamed with Esri Partner JMT Technology Group (of Sparks, Maryland), a leading geospatial and technology solutions provider with a wealth of experience implementing Esri enterprise solutions for field data collection and asset management. JMT Technology Group worked with DowntownDC BID to design, develop, and implement a solution built on ArcGIS technology that streamlines the data collection process, incorporates tools and processes for quality control, and provides integration with the district’s 311 work order management system. DowntownDC BID was already using mapping and reporting capabilities from Esri. Says Kamperin, “This solution provided our team with an updated platform based on technology with which we were already familiar.” Ultimately, the solution allows DowntownDC BID to more effectively understand, plan, and make improvements within its area. iPhone screen shot, illustrating a condition assessment taken while in the field. The DowntownDC BID solution leverages the ArcGIS system, including ArcGIS Runtime SDK for iOS for field data collection, ArcGIS for Desktop to manage and administer the solution, an enterprise geodatabase with PostgreSQL to store the data, and ArcGIS for Server to serve the maps and applications from the Amazon Elastic Compute Cloud. “This implementation provides an integrated end-to-end solution for spatial data management and a platform for future growth,” says Tim Abdella, GISP, project manager for JMT Technology Group. At the heart of the solution is ArcGIS for Server on Amazon Web Services with an enterprise geodatabase implemented in the PostgreSQL RDBMS and built on the ArcGIS for Local Government Information Model. This approach provides a centrally managed environment from which users can access and share data and an opportunity for DowntownDC BID to leverage freely available maps and applications built on the ArcGIS for Local Government Information Model. To support the field-based asset management requirement, a custom, focused iOS application was developed using ArcGIS Runtime SDK for iOS. This field asset management application consumes cached basemap services and data asset services from DowntownDC BID. The final component of the solution is an ArcGIS for Desktop add-in developed to support quality control efforts, integration with the district government’s 311 system via the open311 API, and reporting functionalities that will allow DowntownDC BID to inform property managers of activities and actions taken at user-defined intervals. For more information, contact Karyn Le Blanc, director of communications, DowntownDC BID, or Ashley Flamholz, senior marketing coordinator, JMT Technology Group.